So my last attempt at this delicious cheesecake resulted in a rather ugly (albeit tasty) concoction. But the fact that I didn't get to take any decent photos because we were at someone else's house, in poor light, with no time to prep and I didn't even get to cut it myself bothered me so much I made it again. This time I decided to make minis and keep the flavours simpler. I halved the crust recipe and quartered the filling and this made 2 perfect minis (although they were very full and this amount of crust and filling could have stretched to 3). Again no problems at all making these. I baked them for 40 minutes at 160 degrees and then let them 'luxuriate in their water bath' (oh how I wish that were me!) for another 30 minutes. In a word ... YUM! 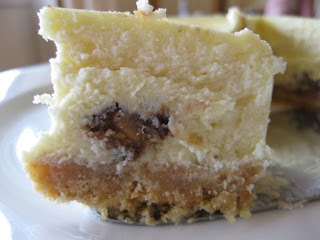 I can see this recipe becoming my go-to cheesecake recipe. I didn't have any problems with browning or the crust cracking so they tasted just as good as they looked this time around! Butter a deep 9-inch springform pan and wrap the bottom of the pan in a double layer of aluminum foil, then put the pan on a baking sheet. Blitz the biscuits and salt in a food processor then add the melted butter and whiz until well combined. Turn the ingredients into the prepared pan and use your fingers to pat an even layer of crumbs along the bottom of the pan and about halfway up the sides. Put the pan in the freezer while you preheat the oven. Wipe out the bowl and blade of the food processor with paper towel. Center a rack in the oven, preheat the oven to 160 degrees celsius fan-forced and place the pan on a baking sheet. Bake for 10 minutes. Set the crust aside to cool on a rack while you make the cheesecake. Reduce the oven temperature to 140 degrees celsius fan forced. In the food processor beat the cream cheese at medium speed until it is soft, about 4 minutes. With the mixer running, add the sugar and salt and continue to beat another 2 minutes, until the cream cheese is light. Beat in the vanilla. Add the eggs one by one, beating for a full minute after each addition. Finally add the sour cream and/or heavy cream and process for another minute. Give the batter a few stirs with a rubber spatula, just to make sure that nothing has been left unmixed at the bottom of the bowl, and scrape the batter into the springform pan. The batter will reach the brim of the pan. 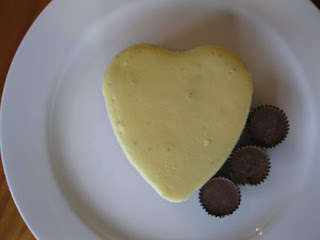 (If you have a pan with lower sides and have leftover batter, you can bake the batter in a buttered ramekin.) Put the roasting pan in the oven and pour enough boiling water into the roaster to come halfway up the sides of the springform pan. After 1 hour, carefully pull the setup out of the oven, lift the springform pan out of the roasting pan and very carefully remove the foil. Let the cheesecake come to room temperature on a cooling rack. When the cake is cool, cover the top lightly and chill overnight. 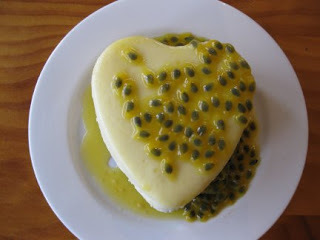 I almost bought mini heart-shaped springform pans yesterday. Yours look really cute. The peanut butter cup version looks soooo tempting! Great choices for your filling. They both look quite enticing. 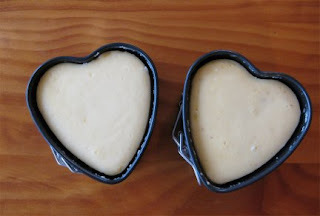 These little heart shaped cheesecakes are so cute! 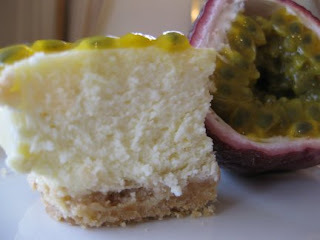 The lemon and passionfruit wins my vote - perfect for summer. Looks adorable and sounds delish! I think I would have loved the PB cup one. They look really lovely. Enough for 3 but only to feed 2 - definitely yum in my book. What cute little cheesecakes!! I love anything with peanut butter and chocolate, so I am a definite sucker for your reeses concoction! Yum!